Since the very first edition of The Valley Patriot in March of 2004, this space has been reserved for honoring local veterans who have either performed heroically in battle or made a significant difference in their community. This month we honor Spc. 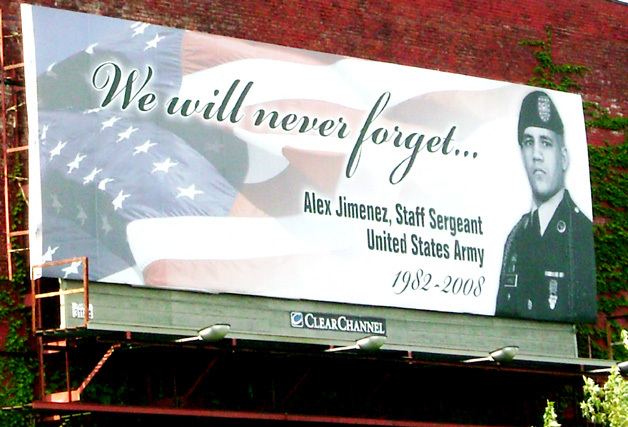 Alex Jimenez of Lawrence whose remains were found last month in Iraq after a 15 month search for the captured soldier. Jimenez is the second veteran to be honored posthumously as a Valley Patriot of the Month. His bravery and his service to the United States Army, his famly and community are a model of patriotism for young people across the country. The death of Alex Jimenez brought an entire community together in sorrow and healing. We at The Valley Patriot continue to pray for the friends, family and fellow military men and women who served with Alex in Iraq. He is a true American hero and we only hope that the cowards who took his life receive the justice they deserve.